Manchester-based Milk Jnr’s & Kidworks has launched two new on-board kids' activity packs for Thomson Cruises’ fleet of five ships. The agency was appointed following the successful roll out last year of the packs it created for TUI Group’s various airlines: TUIfly Nordic, Holland’s Arkefly, Belgium’s Jetairfly and Thomson Airways in the UK. The new first concept for Thomson Cruises is a 'Check In Pack' handed to children when they board a ship, and includes a handy lanyard with a ‘things to do and see' card that's designed to encourage young travellers to explore their ship and interact with staff and crew. The second is an 'Ocean Travel Adventures Treasure Chest' which awaits every child when they arrive at their cabin. 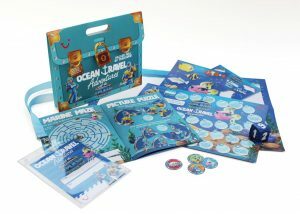 This is made up of various interactive and fun items including an activity book, crayons, stencils, stickers and an underwater themed board game which the whole family can play together.